Pyrethroids are insecticides that are synthetic modifications of natural pyrethrins, which are extracts from the flowers of some Chrysanthemum species. Pyrethroids have been developed for the control of household and agricultural insects, and human lice. Pyrethroids have a very high “selective toxicity” for insects compared to mammals, which is due to higher insect nerve sensitivity, lower mammalian skin absorption and more efficient mammalian hepatic metabolism. Traditionally, pyrethroids have been considered as having relatively low toxicity, particularly when compared to organophosphate insecticides. However ingestion of concentrated pyrethroid-containing products can cause severe, and occasionally fatal, effects. Pyrethroid formulations include aerosol sprays, smoke coils, electric mats, oil formulations, emulsifiable concentrates and wettable and dustable powders. A shampoo and lotion formulation is also available for the control of human lice. The formulated products often combine the synthetic pyrethroids with a synergist, such as piperonyl butoxide (which inhibits their metabolism), and they may also contain other insecticides. Pyrethroids are ion channel toxins that interfere with the function of the nervous system. They modify the “gating” characteristics of neuronal voltage-sensitive sodium channels to delay their closure,1 thereby prolonging neuronal excitation. The toxic effects of pyrethroids result from this neuronal excitation and include a wide spectrum of signs and symptoms from paraesthesia and increased salivation, through to seizures and potentially death (Table 1). Allergic reactions, including contact dermatitis or asthma, are only rarely reported with synthetic pyrethroids. The largest risk of pyrethroid toxicity is from the ingestion of undiluted formulations. The presentation of patients with exposure to pyrethroids depends somewhat on the setting of exposure. Most reports on the adverse effects of pyrethroid exposure have arisen from occupational settings, particularly where insufficient precautions are taken during pyrethroid preparation and application.2 People using pyrethroids in this setting may develop cutaneous paraesthesia as well as ocular and upper respiratory tract irritation. The cutaneous sensation, typically described as stinging or burning, may not develop until several hours post-exposure, and can be associated with erythema but not usually other skin lesions. Acute systemic symptoms have also been reported in cases of careless use of pyrethroids. There are few studies which have investigated the possibility of long-term adverse effects in people exposed to pyrethroids occupationally. The risk of pyrethroid toxicity is low when pyrethroids are sprayed indoors, e.g. in the home or office, by professional applicators. However, anecdotally it is not uncommon for some people to complain of a range of symptoms from such exposures. There is general agreement that a period of several hours (ideally at least 24 hours) should be observed between pyrethroid application and re-occupation of the building. Spray droplets can settle on furnishings, causing potential ongoing skin exposures, but it appears that re-entrainment of particles into air is minimal. If measured, floor or other surface levels can be an unreliable guide to air levels of pyrethroids. The use of permethrin as a topical treatment or shampoo for head lice or scabies is associated with relatively low risk of toxicity, if used according to directions. However, the NZNPC is aware of some caregivers using pyrethroid-containing fly sprays to treat children’s head lice. There is some risk with this; adverse effects can include scalp and face burning and itching, and ocular discomfort if sprayed into the eyes. An asymptomatic child who briefly activated an aerosol spray into her mouth. If a patient presents with signs and symptoms of toxicity and a history of exposure to a pyrethroid, it is recommended to phone the National Poisons Centre for advice on management. Patients with an occupational exposure to pyrethroids may require symptomatic treatment for cutaneous paresthesia or upper respiratory tract irritation. While controversial, the use of creams containing vitamin E has been claimed to be useful for paresthesia,4 although this treatment is more likely to be helpful if applied prior to exposure. Relief may be obtained by the use of lipophilic agents, such as cooking oil or white soft paraffin. A cool cloth or ice may also be helpful. Cases of pyrethroid toxicity must be notified to the Medical Officer of Health, under the Hazardous Substances and New Organisms Act 1996. 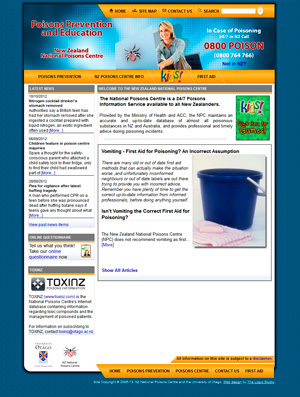 A short electronic notification form is located on the bestpractice dashboard (log in at www.bestpractice.org.nz or go directly through MedTech) – look for “Hazardous Substances & Lead Notifications”. Primary care practices that do not use bestpractice Decision Support software, should still inform their Public Health Unit of any notifications. Access to the notification form for non-MedTech Patient Management Systems will be available in early 2014.
phone the National Poisons Centre on 0800 POISON (0800 764 766). “Treating head lice”, BPJ 14 (Jun, 2008). “Scabies – diagnosis and management”, BPJ 19 (Feb, 2009). Bradberry SM, Cage SA, Proudfoot AT, Vale JA. Poisoning due to pyrethroids. Toxicol Rev 2005;24(2):93-106. He F, Wang S, Liu L, et al. Clinical manifestations and diagnosis of acute pyrethroid poisoning. Arch Toxicol 1989;63: 54-8. Giampreti A, Lampati L, Chidini G, et al. Recurrent tonic-clonic seizures and coma due to ingestion of type I pyrethroids in a 19-month old patient. Clin Toxicol 2013;51:497-500. Flannigan SA, Tucker SB, Key MM, et al. Synthetic pyrethroid insecticides: a dermatological evaluation. Br J Ind Med 1985;42:363-72. Altenkirch H, Hopmann D, Brockmeier B, Walter G. Neurological investigations in 23 cases of pyrethroid intoxication reported to the German Federal Health Office. Neurotoxicology 1996;17: 645-51.